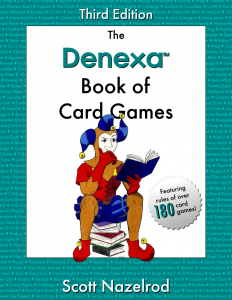 Over time, a deck of playing cards will spend much of its life in contact with either a table or players’ hands. Neither of these are particularly clean: tables often have dirt and food residue on them, and human hands usually have at least a layer of skin oil on them, if not more dirt. All of this nastiness has a tendency to end up on your cards. Paper cards tend to absorb the dirt and oils, to the point where eventually they simply have to be replaced. 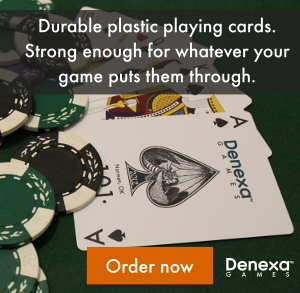 Since Denexa 100% Plastic Playing Cards are not porous, the gunk just sits on the surface of the card. Under some conditions, top-layer inks (which are not as well-bonded as those closer to the card surface) can also be displaced from the backs of the cards and settle around the edges of the cards, forming a patina that looks like a fuzzy haze of red or blue on the face of the cards. A dirty deck of cards can usually be identified by the presence of this patina and slight stickiness during game play. Fortunately, it’s easy to restore your cards to like-new condition. You just have to clean them! Fill the kitchen sink with warm water—not too hot, as hot water may warp the plastic—and add a mild dish soap. We found that Dawn® Antibacterial Soap works well. Dump the whole deck of cards into the sink. Then, use a soft towel—a microfiber towel works well—to clean the surface of the cards, especially near the heavily-handled edges, where the patina and skin oils tend to build up. Don’t use abrasive soaps, like those containing pumice, or an abrasive cleaning tool, as these may damage the surface of the cards. Run the cards under cool water to rinse off the soap, then dry them off with a paper towel, or leave them sitting on a bath towel until the water dries. Don’t use a heater or hair dryer to speed drying. After the cards are dry, you should notice that your cards handle much better, and with much less stickiness! It’s probably a good idea to verify them before putting them away to make sure that you didn’t lose any cards during the cleaning process.